-The max pulling force for stringing operation can be preset, pulling force in the rope can be read on the line pull gauge. Pulling speed can be read by gauge on the board. -Hydraulic clamp for clamping the steel wire rope when changing the rope on reel winder. -Mounted on trailer with rigid axle for towing at max. speed of 15 km/h on work site. -With GSP steel reel 1400mm diameter. -Closed hydraulic circuit, infinitely variable pull / tension force control in both directions. -The max. tension / pull back force for conductor stringing operation can be preset, the tension /pull back force can be read from the tension gauge of machine. -Hydraulic oil cooling system. Hydraulic front jack. -Bull wheels lined with wear proof MC nylon lining segment. 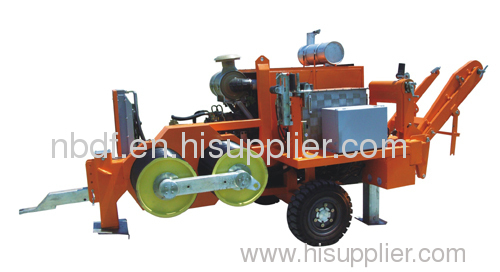 -Optional 4 hydraulic power outlets to control 4 sets of hydraulic reel stands. -Mounted on trailer with rigid axle for towing at max. speed of 15 km / h.
2. We will ship the products within three months normally after receiving the payment. 3. 25 years of production experience and more than 1000 customers in the country and abroad market. The set of 18 ton puller and 16 ton tensioner have been sold to more than 6 countries: such as Russia, Vietname, Mexico, Egypt etc.